L.L.M. in Taxation, awarded by New York University School of Law, 2009. Juris Doctor, awarded by The University of Texas at Austin School of Law, 2007. B.B.A. in Finance with honors, awarded by the Mays Business School, Texas A&M University, 2004. Admitted to practice before the U.S. Tax Court, 2009. Licensed to practice law in the State of Texas, 2007. Contract Attorney, Hrbacek & Associates, Sugar Land, TX, 2009-2010. Legal Counsel and Business Consultant, Executive Living Inc., Houston, TX, 2005-2010. Logan R. Gremillion is a graduate of New York University's renowned Graduate Tax Program. While at The University of Texas at Austin, Mr. Gremillion received his J.D., which was preceeded by his B.B.A. in finance (with honors) which he received from the Mays Business School at Texas A&M. 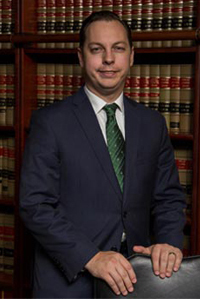 He has been a member of the State Bar of Texas since 2007. From 2009 through 2010, Mr. Gremillion practiced tax law at Hrbacek & Associates, where he advised small to mid-sized businesses and partnerships in federal tax planning and controversy issues, representing clients before the IRS. Mr. Gremillion is an Eagle Scout, a native Houstonian, and very active in the Houston business and real estate communities.